Last week, the mockumentary genre gazed so deeply into its own navel that it ended up in its large intestine. Bernie, Richard Linklater's faux documentary about a real-life murder, marked a questionable development in the genre's 48-year-old history. Now, the mockumentary has nowhere else to go. Far from its humble roots in small indies of the 1960s, the mockumentary is now mainstream. It's a staple of TV sitcoms, horror movies-of-the-week, and countless hilarity-challenged comedies. There's even Surf's Up, an animated documentary for kids. Plot: Shot in mock-serious black and white, A Hard Day's Night shows a day in the life of The Beatles circa "Can't Buy Me Love." The Fab Four deal with Paul's weirdo granddad, look for a lost Ringo, perform at a concert, and spit out one-liners in their charming/ridiculous Liverpudlian accents. Victims of their fame, The Beatles use their wits to escape crazy fans and bothersome journalists. John convinces a fan that he isn't John Lennon—he says his face isn't quite right, and she agrees—while Ringo, asked whether he is a "Mod" or a "Rocker," says he's a "mocker." Innovations: The Beatles didn't just revolutionize pop music forever, they also starred in the first feature-length mockumentary. A Hard Day's Night is more concerned with parodying the concert movie subgenre than the documentary genre as a whole, but its small ambitions didn't hinder it from becoming an accidental masterpiece with an influential legacy. Plot: The 23-year-old protagonist of the movie's title decides to film himself to understand his life, but only manages to screw it up. He gets dumped by his camera—shy girlfriend, gets arrested for filming people through their windows, and becomes consumed by the desire to record every piece of trash in his neighborhood. Living in a Truman Show of his own making, he begins to go crazy (of course), but the film itself alternates between scenes of David being a creep and truly poignant moments of spontaneous filmmaking. Innovations: If A Hard Day's Night simply parodied the documentary, David Holzman critiques it. The unbalanced behavior that follows David's decision to turn the camera on himself makes an obvious but too forgotten point about documentary filmmaking: When people are aware that there's a camera pointed at them, they no longer act like themselves—a phenomenon reality TV show producers couldn't do without—making it difficult, if not impossible, to capture a subject as they really are. Innovations: The astounding thing about Medium Cool is that it's the only mockumentary to be filmed during an actual historical event—in this case, the 1968 Democratic National Convention in Chicago and the five-day riot that followed it. After the assassinations of Martin Luther King and Robert Kennedy made another round of protests inevitable, writer-director Haskell Wesker changed his script in the middle of production to make it more political and changed his shooting schedule to coincide with the Convention. Thus, fictional characters enter reality (the actors and camera crew shot scenes in the midst of the Convention and the outside protests), while real people enter fictional situations (several local Black Panther members played themselves). Plot: Midnight in Paris was hardly Woody Allen's first foray into the 1920s. Allen plays Leonard Zelig, a "human chameleon" and Jazz Age celebrity who assumed the manners and appearance of the people around him. Presented as a straightforward documentary, the film relates Zelig's accomplishments and eccentricities, largely from the perspective of then-contemporary '80s academics. Innovations: Woody Allen experimented with mockumentary techniques in 1969's Take the Money and Run, but perfected his take on the genre with Zelig (and later Hannah and Her Sisters and Sweet and Lowdown). Allen's dry, pedantic wit perfectly complements the type of dry, pedantic documentary he parodies, but Zelig represents a high point in the mockumentary's history because Allen never lets his satire get in the way of his storytelling. Plot: You already know this, right? A group of aging, pretentious heavy metal rockers fail to realize that their heyday passed them a long time ago. Innovations: Although Rob Reiner directed Spinal Tap, star Christopher Guest gained the most from it, following up with several more mockumentaries with similar conceits and, ahem, diminishing returns. 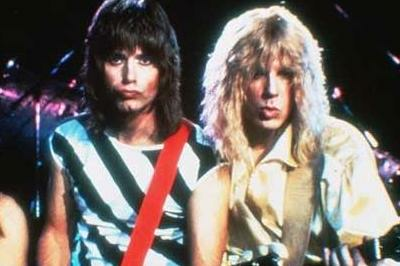 But Spinal Tap—or rather, its success and legacy—deserves to be recognized for its part in limiting the comedic potential of the mockumentary genre to ridiculing earnestness and sincerity. Which is too bad, because as Borat demonstrated, the mockumentary can feel fresh and inspire laughter in the right hands. Plot: A camera crew follows Ben, a charming, well-educated serial killer, on his "adventures" of killing old people in their apartments. The premise doesn't make much sense, until the cameramen stop being dispassionate flies on the wall and turn into Ben's accomplices in his brutal, sadistic crimes. Innovations: Less a horror film than a pitch-black comedy, this Belgian cult classic hits a lot of the same notes as David Holzman's Diary about people becoming performers once they're placed in front of the camera. But it also explores the reverse phenomenon, still too seldom discussed: that of filmmakers becoming captives to their subjects' personalities. Plot: Peter Jackson and Costa Botes recount the achievements of forgotten New Zealand director Colin McKenzie, the greatest filmmaker to have ever lived, who invented the close-up, the tracking shot, and sound and color in films long before Hollywood. Tipped off by a neighbor, Jackson discovered McKenzie's lost films in an old shed and presents clips from them in Forgotten Silver. Industry heavyweights like film historian Leonard Maltin, actor/director Sam Neill, and producer Harvey Weinstein also attest to McKenzie's singular genius. Innovations: As the uproar about Catfish's authenticity demonstrated, audiences are made quickly upset by documentaries that turn out to be fictional. Catfish's filmmakers should have learned that lesson from Peter Jackson, who, before wowing the world with his Lord of the Rings trilogy, hoaxed New Zealand TV viewers about a dazzling national treasure who never existed. It's too bad that Jackson's detailed recreations of early cinema will be shadowed by the outcry and fascination over the hoax, but let that be a lesson for filmmakers now and forever: Audiences will hate you if you try to pull one over on them. Plot: Three young documentarians go in search of the Blair Witch. None come back. Innovations: Whereas the events in Forgotten Silver were fictional, many people who saw The Blair Witch Project initially refused to believe that it wasn't real. By the film's premiere, the mockumentary was 35-years-old, but BWP's reception proved that the it still wasn't a household genre. (Of course, the film's marketing campaign, which did everything in its power to blur the line between fact and fiction, is also to blame.) BWP deserves acknowledgment for heralding an entirely new type of horror film, the "found footage" genre, with its signature low-budget look, no-name actors, shaky cams, and lack of spectacle. Plot: A faux-British documentary recounts the history of The Confederate States of America, forged in the South's victory in the Civil War War of Northern Aggression and conquest of the North. The C.S.A. allied with Germany (but not Japan) during World War II, and its best and brightest (Mark Twain, Elvis Presley) fled to Canada. Segments are interrupted by fake commercials for cringe-worthy products that the credits reveal once existed. Innovations: Mockumentaries tend to be small in scale, focusing on an eccentric, a dog show, or the mysterious murders of some kids. The Confederate States of America expands the scope of what a mockumentary can really do-in this case, rewriting the last 150 years of world history. Plot: A San Diego couple, "haunted" by a demon, record what goes bump in the night in their new home. That's basically it. Innovations: Although The Blair Witch Project innovated many of the "found footage" genre's tricks of the trade, it was the success of Paranormal Activity-the first big horror mockumentary hit after BWP (it took eight years! )—that set the terms for the present and future of horror films. Paranormal Activity's sequels plus Cloverfield, Chronicle, The Devil Inside, Project X and Trollhunter have made mockumentary and "found footage" the new normal. Thus was the newest era of the mockumentary born, and how it will die: drowning in its excesses of tortuous plots, cheap visuals, and nausea-inducing camera work.